The Dove Beauty Cream Bar is one of the most clean feeling soap that comes in the form of a bar. Rinses clean with no residue, but does not dry out your skin. I don't prefer to use bar soaps, but that is just a personal con. I have not used any thing else since the first time i bought it.It leave me feeling fresh and clean.Also it dose not leave any thing behind. Very good product and i will keep using it. Cleans with out drying out skin. 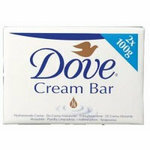 Dove Cream Bar is really good for my dry skin, it moisturizes and rejuvenates my sensitive skin and stops flakiness. Nice smell, moisturizes skin and makes your body feel soft throughout the day. I am using this product since last two years .